Photo by Lori Whelan from the Torontoist Flickr pool. You’ve probably heard it’s over 95,000 households long—and growing. 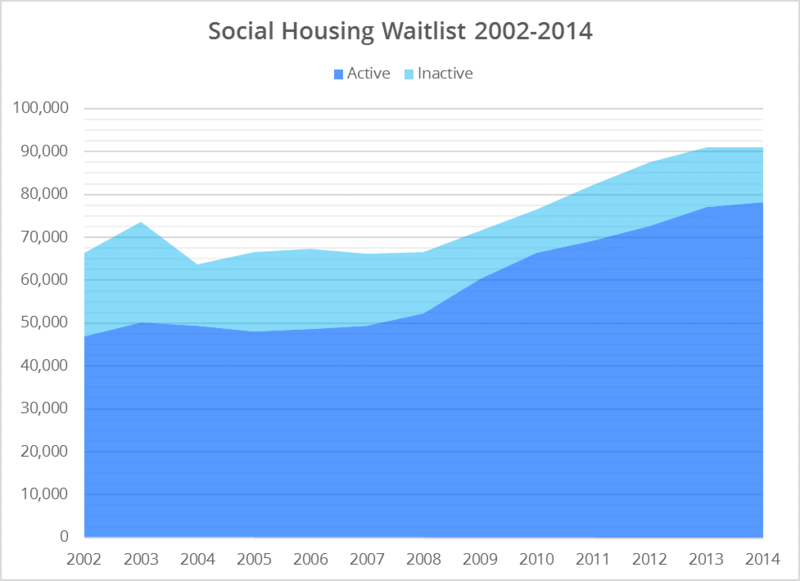 But there’s a lot more to know about the social housing waitlist, and we’ll explain. While the waitlist grows every year, not all applications are “active.” Applicants whose information is not up-to-date may find their applications inactivated or cancelled. The waitlist is maintained by a central agency called Housing Connections. They keep track of available units across the city. Most of these units are in Toronto Community Housing buildings, but others are provided by co-ops, non-profits, and private landlords. Applicants can be referred by social workers or social services, but you can also apply on your own, in person, via mail, or on the hilariously antiquated Housing Connections website. Applicants can choose several buildings with available units they would like to live in. They must also submit proof of citizenship and income, and keep their application up-to-date. Some applications get priority over others. Special priorities include people fleeing abuse; the terminally ill; and the “over-housed” (people who need a smaller apartment). According to City policy, one in seven units are reserved for people who are homeless, families who have been separated, and people who are 16 or 17 years old. Most prioritized applications are from homeless people. The waitlist includes seniors, singles, couples, and families. Demand for single-bedroom units is highest, but larger households may find themselves waiting the longest for a suitable unit. The length of time people wait depends on several factors, including how many buildings they have put themselves on the waiting list for, what kind of unit they want, and the (very slow) rate at which people move out and units become available. 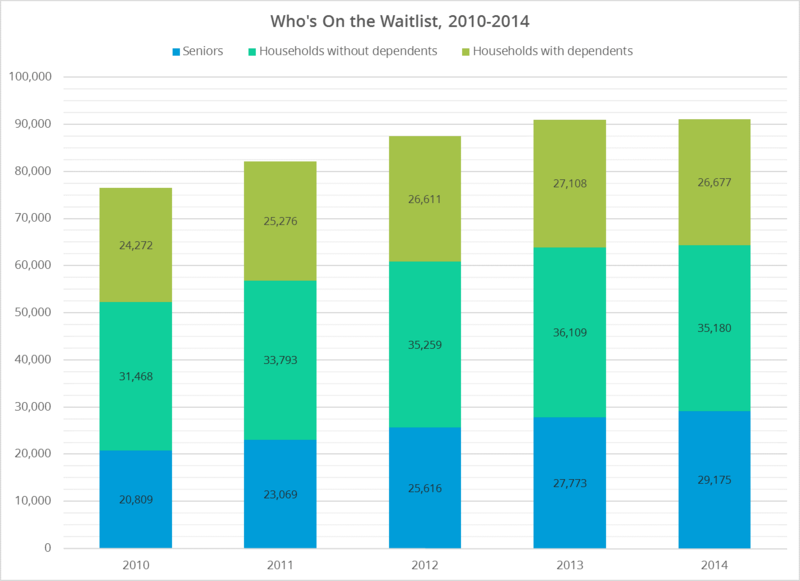 The vast majority of applicants—over 50,000 households as of fall 2015, half of which are seniors—are waiting for one-bedroom units. However, some 24,000 households with dependents are also waiting for units with two or more bedrooms. Housing Connections estimates the wait is anywhere from one to five years for a one-bedroom unit to up to twelve years for a three- or four-bedroom unit. Your mileage may vary. It’s a lengthy and rather inefficient process, but it may get smoother. The City has been piloting a “choice-based” system that gives people on the waitlist access to viewit.ca-style listings and also prioritizes people who can move in right away. What do people do in the meantime? Where do they go? The most common issue faced by food bank clients in Toronto, regardless of all else, is the per cent of their income they spend on their rent. It is the most pressing, non-negotiable expense, from which other necessities, including food, are sacrificed. For many clients coming to the food bank is the only way they are able to eat at all while maintaining their housing. For those receiving social assistance, being able to afford a place to live in Toronto is next to impossible without encroaching into money allotted for all other basic needs. Parents tend to let themselves go hungry before their children do. When their children are hungry, they depend on services like the Student Nutrition Program, which receives City funding but is largely run by volunteers and funded by donations. For meeting housing costs specifically, they might depend on the Toronto Rent Bank, which gives small interest-free loans to cover a few months’ worth of rent for people who are about to be evicted. There is also the Housing Stabilization Fund, a City program that replaced the provincial Community Start-up and Maintenance Benefit (CSUMB). It provides emergency funds for people who need to relocate urgently. All too often, these emergency measures are insufficient, unevenly distributed, or inaccessible. When people become homeless, they once again depend on other City-funded programs, like the shelter system and Streets to Homes. With each successive level of the social safety net that a person slips through, the harder it is to climb back up again. Why is the list so long? The flip answer is that Toronto real estate is ridiculously expensive. People with $100,000-a-year household incomes complain about it. People with $30,000-a-year household incomes complain about it. People who make $8,200 or $13,3003 are going to complain, too. The only difference is that some people’s despairing letters end up in the Globe and Mail; others, in a city councillor’s office. We’ve all got problems, right? The more thorough explanation is that over the past 20 years, the federal, provincial, and municipal government have been divesting themselves of funding social housing in a cascade of downloading. There was once a time when CMHC provided mortgages and subsidies for new social housing; however, federal funding for social housing is declining, and there will be no federal funding by 2031. The Ontario government recently phased out $150 million in funding meant to compensate Toronto for the cost of downloading social housing in the 90s. Further, it continues to keep social assistance amounts too low for many people to pay rent. The City, to a degree, has picked up the slack. It is currently providing subsidies for the co-ops whose agreements with the federal government have expired, and it has participated in campaigns demanding that other orders of government contribute their fair share. There has been considerable attention paid to TCHC’s ballooning state of good repair backlog; maintaining the affordable units the City has (to say nothing of building more) is essential. However, the question of sustainably funding operating expenses—running the social housing system, keeping shelters open—has not really been raised at all. Shelter, Support and Housing, the City division which funds and manages social housing, is dipping into reserves this year to help cover the loss of provincial funding.4 TCHC needs $13.7 million more from the City to implement the mayor’s task force’s recommendations. Until the City can prioritize improving, not just maintaining, its social housing system, 175,000 people will continue to wait.